On-Campus Jobs: Getting the Most Bang for Your Buck! Before I went off to college, I was told that I was about to experience the “best years of my life!” This advice heralded to be true; I met new people, joined a variety of student organizations, and explored my new found freedom! However, an area that I struggled with was financial independence. After my freshman year, desperate calls home for “pizza money” soon grew old. I knew that I needed a job, but I didn’t want to sacrifice my time, which is why I sought on-campus jobs. The beauty of on-campus jobs is that unlike many off-campus jobs, they’re sympathetic to the fact that you are a student; if I had a huge mid-term that I needed to study for, it wasn’t an issue for me to call in to work. I’ve found that some of the best on-campus positions are desk jobs, such as a desk assistant in a residence hall or an information desk worker in the student center. I actually held both of these positions in college and I loved them both, because not only was I able to meet new people and interact with my peers, but I was also able to study or complete class work, all while getting paid! try to get the most “bang-for-your buck!” If you’re looking for free or discounted meals, look for positions in your school’s food services department; if you’re looking to build your resume’ for grad school, look for paid research opportunities; if you’re exceptionally talented in a specific subject area, look for tutoring positions; if you have a lot of free-time, seek into being a bus driver for your school’s campus transit system. Another tip for landing on-campus jobs is to ask your professor if they need any research assistance, this often times leads to a paid opportunity! As you can see, the on-campus job opportunities are endless and I encourage you to find the one that best fits your schedule, your personality, and your needs! Read more tips about student jobs from other students. Thank you B. Hart for sharing some great tips about on-campus jobs. I like your bang-for-your buck advice. Good luck to you. Most higher education facilities offer prospective candidates the opportunity to apply for various jobs available through the university. When filling out college applications, be sure to notify universities of your interest in learning more about their Student Employment Program. Through the program, students have the option to pay off some of their tuition by agreeing to be employed part-time at select on-campus locations, while also gaining work experience that can be listed on future applications. You will be paid your state’s minimum wage or more, depending on the level of financial need demonstrated, and will be paid directly unless you specifically request your school deposit the paycheck to your bank account or have it go towards your tuition. Unlike regular employment, on-campus shifts are flexible and adjusted to accommodate your schedule, leaving plenty of time for classes and mid-afternoon study sessions. Applications are typically available through the university’s website. However, if you prefer applying in person, buildings such as the Career Center or Student Employment Office will have applications available upon request. If you choose to work on-campus, it is best to apply to multiple departments. Each one will have openings accessible to potential employees. Ideally, the jobs will vary from department to department which will keep the selection fresh and allow you to sift through choices that best suit your idea of optimal employment. If you prefer a quiet atmosphere with low levels of activity, apply for positions available in the library or bookstore. These jobs may require you to shelve books, file paperwork, or work on the computer. The bookstore may request applicants have experience working with people and harbor a good understanding of basic mathematics. If you prefer a more sociable and lively setting, consider applying for jobs that are heavily involved with campus life. 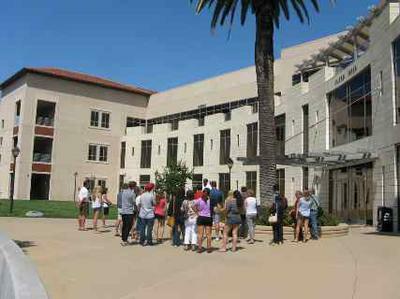 Tour guiding is popular among students who enjoy conversing with peers and potential freshman. Working as a tour guide also opens up the opportunity to meet new friends. Regardless of your ideal work environment, schedule, or homework load, the Student Employment program has a job perfect for you. All you need to do is apply. Thank you for reminding students about the Student Employment Program. There are many on-campus jobs, through work-study and not, available to students. A student job is a great way to learn job skills and make some money for college. Best of luck to you. I never thought I would be able to keep my own grades up to where I could pass a test, but here I am helping others. Not only am I getting paid for working with other students, I am taking more pride in my own studies. I have tried other jobs, I have worked at fast food places. They didn't go to well. I messed up orders, over and under cook food. I have worked with kids. That didn't go to well. I guess I'm not a kid person. I have worked doing food delivery. I received speeding tickets trying to get the orders out on time. I have gotten in a wreck trying to prevent the food from falling on the floor. As you can see I didn't do well with other jobs, until I started working at the school. This is by far the best job I have had since I came to school. I guess what makes this job so great, is that it is something I can do for others. I work one on one. Not only do I help the students with things like writhing, which is one of the things I love to do, and reading, math, and what ever they have problems with. I get to listen to their hopes and dreams. Some of their stories are they didn't realize that college was so hard, most have these ideas colleges are a continual party, from dawn to dusk. They wake up and see they have to study and work hard, if you want to graduate on time. Some of the stories are about crazy stuff, like, do I know this guy, or have I heard anything about this girl, which I tell them jokingly, are you serious, you are in need of help with your school work and you want to know who is the best date. The stories of how many never thought they would be in college, some come from backgrounds like me. No one ever went to college in the family, we are the first to even go to college in our families. The job is more than the paycheck, which I thank God for. My parents have very little money. My dad works in a lumberyard, he has to work long hard hours just to make ends meet. They do all they can to keep me in school. This job helps me with things my parents cannot do. One of the things is, it helps me with food, because I could not get a meal plan this year. This job helps me to be able to have a meal every day. I would recommend working with students to those who have a passion for people. This is the best job, if you like helping others. Read more about the best Student Jobs. Thank you William for sharing your job experience. Sometimes you have to try a few different jobs before you find the best one. I’m glad you find the job helping others so rewarding. Best of luck to you.